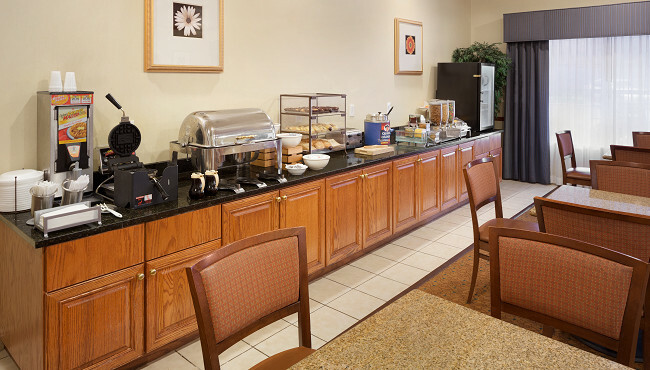 Start your day with a free, hot breakfast at the Country Inn & Suites in Fairburn, which features hearty items like grits, bacon and biscuits with gravy. If you prefer a lighter morning meal, you can enjoy fresh fruit and yogurt. Several nearby restaurants offer plenty of options for lunch and dinner. You can order Mexican specialties at Los Mariachis, hibachi and sashimi at Nikko Japanese Steakhouse & Sushi Bar, or familiar favorites at Outback Steakhouse and Cracker Barrel.